106 Zarek Hernandez (18-4) placed 2nd and scored 20.0 team points. 120 Joe Huerta (6-3) placed 4th and scored 14.0 team points. 126 Carson Droddy (14-6) placed 2nd and scored 18.0 team points. 132 Yahya Maqavi (10-4) placed 2nd and scored 18.0 team points. 138 Amir Mussali (16-3) placed 1st and scored 26.0 team points. 152 Brandon Huerta (34-0) placed 1st and scored 28.0 team points. 160 Tyler Brode (19-14) placed 3rd and scored 16.0 team points. 170 John Gonzalez (24-10) placed 4th and scored 14.0 team points. 285 Dwayne Murray (4-3) placed 5th (Regional alternate) and scored 11.0 team points. 95 Addison Garcia (23-8) placed 2nd and scored 18.0 team points. 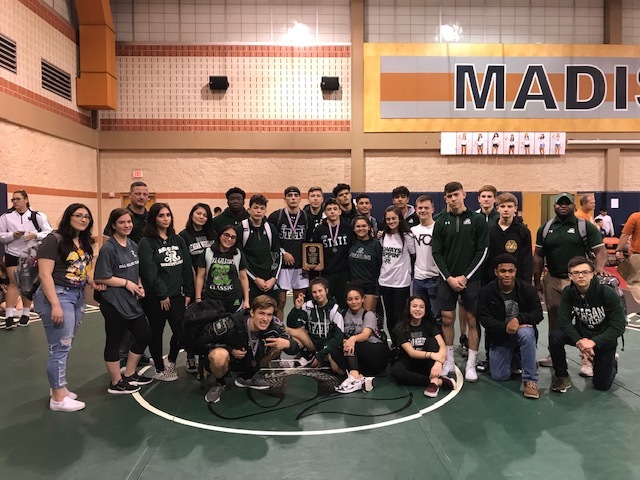 In addition, the Reagan boys finished 2nd Place behind Churchill in the Team Standings for the District Tournament.